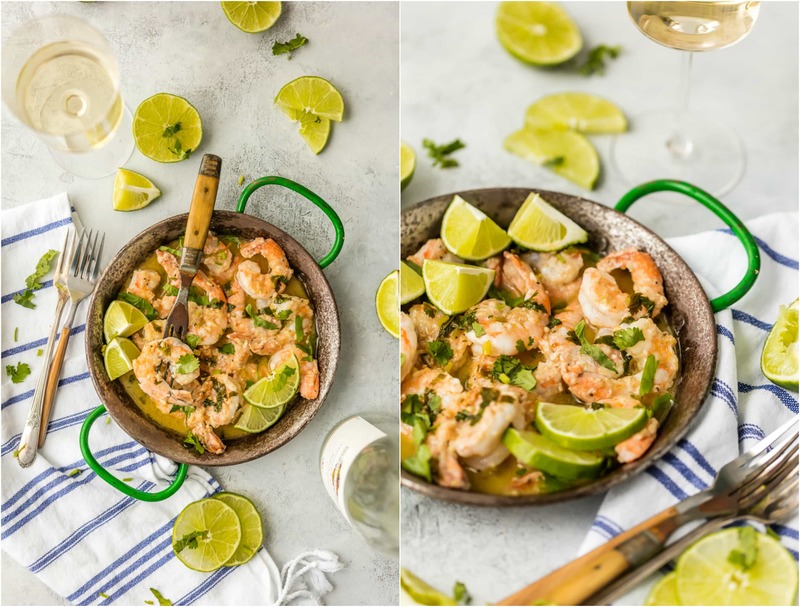 Make dinner (or appetizer night) easy with ONE POT CILANTRO LIME SHRIMP SCAMPI! Made in 15 minutes. Perfection. It’s healthy recipe time! I don’t do this often, as you cheese lovers know, but once in a while…skinny it is. Once in a while you just want to refuel, eat something good for you, and get a good night’s sleep. I mean, I’ll still watch reality tv, but we all have our vices. 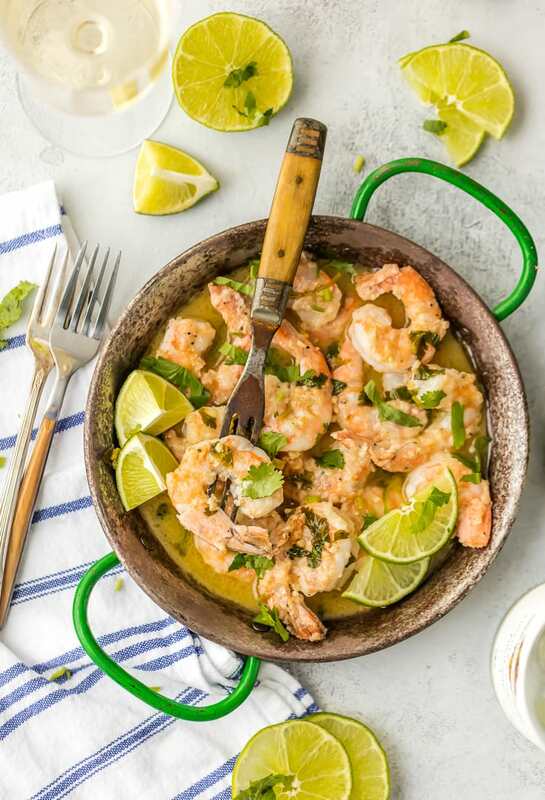 This One Pot Cilantro Lime Shrimp Scampi is one of my favorite quick and easy recipes. So much flavor while still being relatively healthy, and MAN is it easy!! Ready and on your table in minutes. Win Win Win! 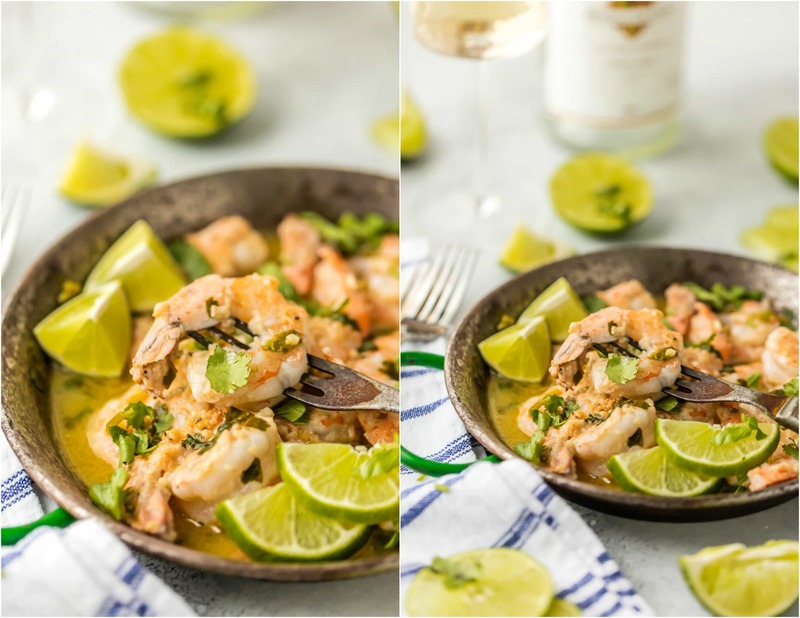 On those busy nights where all you want to do is eat semi healthy but not skimp on flavor, this Cilantro Lime Shrimp Scampi is for you. Did I mention it’s made in one pan and in minutes?! 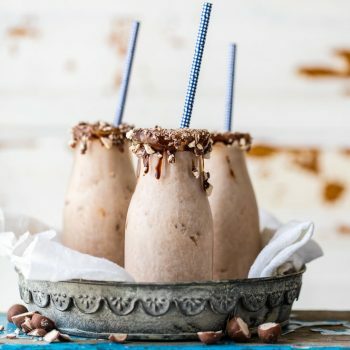 You won’t believe the ease of this recipe. You will be as obsessed with it as I am with cilantro! 1 1/2 pound jumbo shrimp cleaned and deveined. In a shallow bowl, stir together the flour with a pinch salt and pepper. Set aside. Heat a large frying pan over medium/high heat. Add the olive oil and allow to heat up. 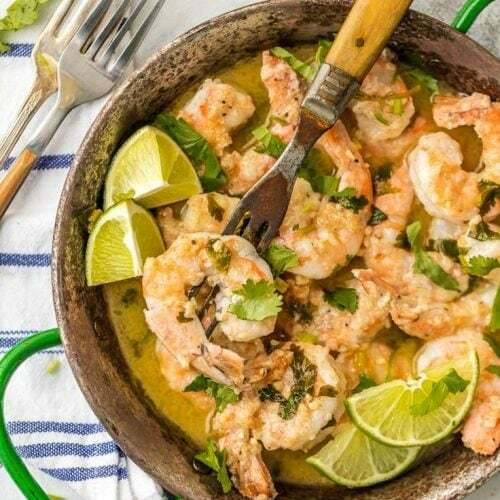 Toss the shrimp in the flour mixture and add to the pan in batches. Cook for approximately 2-3 minutes, turning/tossing occasionally. When opaque/cooked through, transfer to a plate and set aside. Reduce heat to medium and add in two tablespoons butter. When the butter has melted, add the garlic and sauté for 2-3 minutes or until translucent and fragrant. Slowly add in the wine, lime juice, and cilantro. Bring to a boil and then reduce to a simmer and allow to cook for 2 full minutes, stirring occasionally. Whisk in the remaining butter a bit at a time, allowing it to melt before adding more. add the shrimp back into the skillet and coat completely with the sauce. Sprinkle with more cilantro and garnish with lime wedges. Serve hot served with rice, toasted bread, or pasta. I am in the cilantro club with you! You can be President and I’ll be your Veep. Love the cilantro, but is that much butter really healthy????? I like butter and am not fat phobic, but I do watch my calories – one of those things I have to do now that I am older. Wish I could get my husband to eat shrimp that aren’t breaded and deep fried. So I’m thinking I could try this with chicken, perhaps. I’m a cilantro loverrrrr… My goodness this tiny little leaf just takes food to the next level..
You had me at one-pan, and I absolutely love cilantro. I add it to almost anything. One of my kids hates it, and I just don’t get it. Can’t wait to try this! 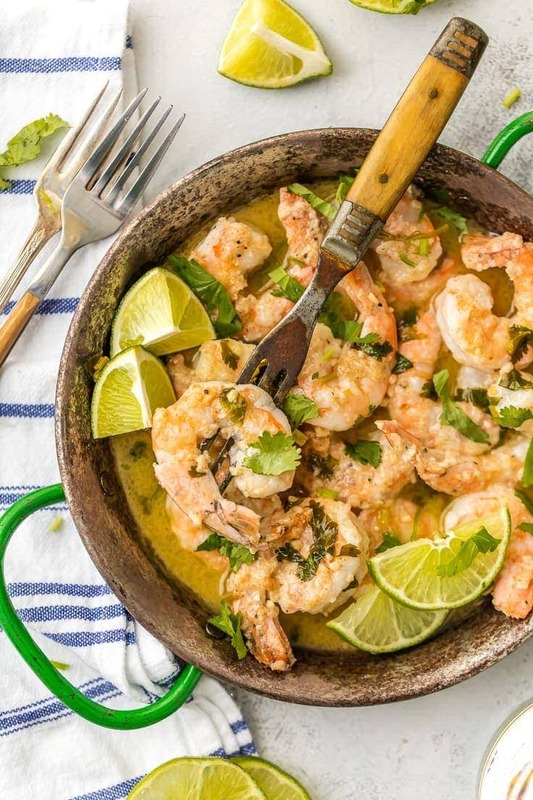 Cilantro Lime is the best way to have shrimp! I have to admit that I am not a cilantro fan, but I can handle it in very small doses, lol. ;) That being said, this dish does look amazing, and I love how quick it can be on the dinner table. I loooove cilantro! 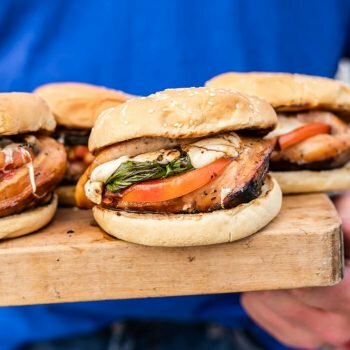 This meal looks right up my alley! I just love everything about this dish. 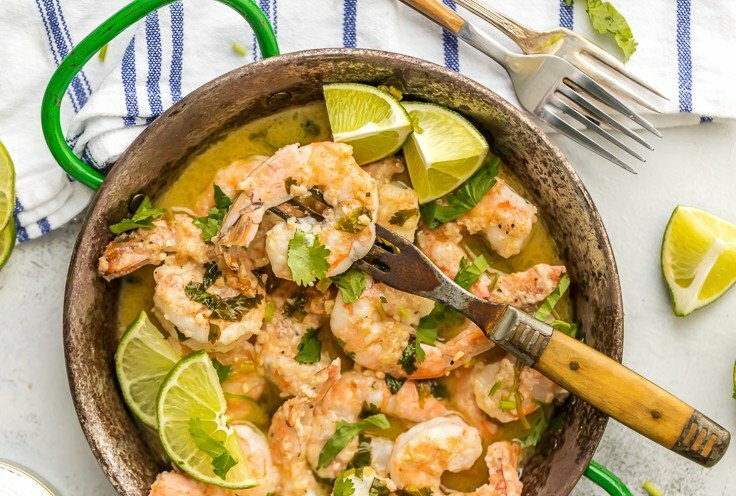 Shrimp is such a wonderful way to enjoy seafood because it cooks so fast and I love your combination of lime and cilantro. Great flavors, that go wonderfully together. I also love your photos and the pan you’ve chosen for this dish. 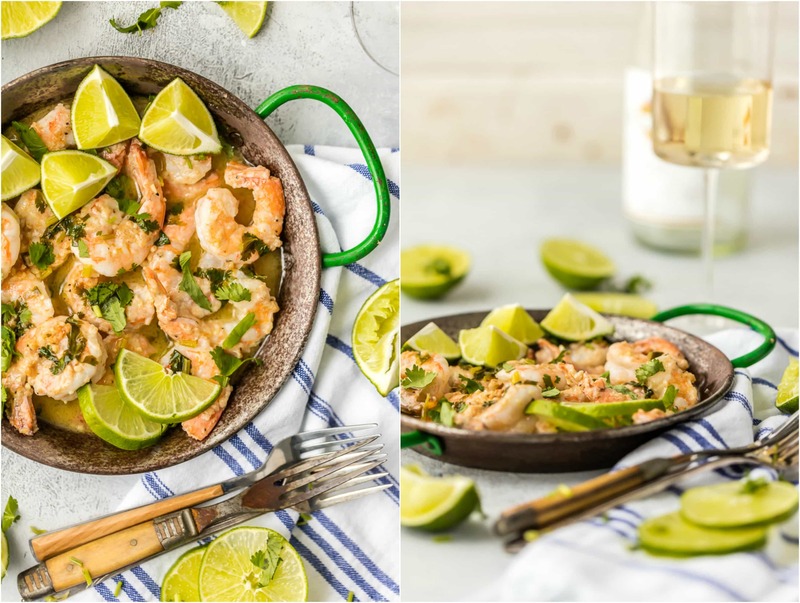 You are so lucky to have a green skillet :) It’s perfect for this dish!